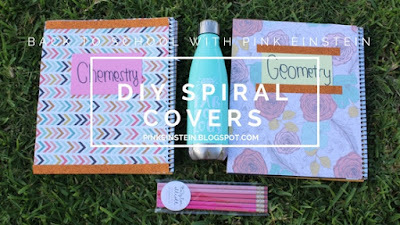 My first DIY of the school year are these super easy yet super cute spiral covers. I wanted to do a DIY that required supplies that most people would have around their house. Most of the DIY videos I see on YouTube require things I have to go out and buy and I don't have that kind of time so I used the things I found in my craft bin to make this simple DIY. Obviously I don't have to show you how to make these covers because it's really easy but sometimes you need a little inspiration to get your creativity flowing (lol that was cheesy). You will also see through out the post that my spiral looks backwards but it's really not, it's just a left handed spiral. Step One: Lay your scrapbook paper under the cover pretty side down and trace around the cover. Step Two: Cut out the scrapbook paper and lay it over the cover to make sure it's the right size. Step Three: Using Mod Podge, cover the cover of the spiral. My Mod Podge is at my other house right now so I used school glue which works too. 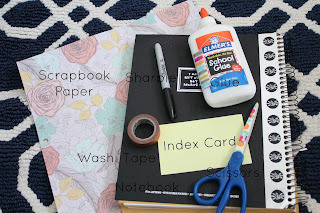 If you have Mod Podge I would cover the top of the scrapbook paper as well. Step Four: Write the subject of the spiral or your name on a note card. Step Five: Using washi tape, tape the index card to the front cover. And your done! If you tryout this DIY take a picture and post it to Instagram with the hashtag #B2SWithPE.